Los servidores DNS del proveedor de servicio de internet del estado CANTV no respondían las solicitudes DNS sobre Facebook, Twitter, YouTube, Instagram y Periscope, impidiendo el acceso a los usuarios. Alrededor de una hora después [de las 11pm], dichos bloqueos fueron liberados y el acceso a esos sitios volvió a ser libre. Innumerables reportes de usuarios en las redes se suman a mediciones específicas de los servidores DNS del ISP. The DNS servers of state internet service provider CANTV were not responding to DNS requests for Facebook, Twitter, YouTube, Instagram, and Periscope, denying access to the users. Around an hour later [from 11 pm], the blockages were lifted and access to the sites was back. Countless reports of network users indicate that the blocking was conducted through the ISP's DNS servers. This is not the first time that this type of blocking has happened in Venezuela. In May 2017, the Index of Censorship published evidence of 41 sites being blocked, including three independent media sites: vivoplay.net, elcapitolio.tv and vpitv.com. 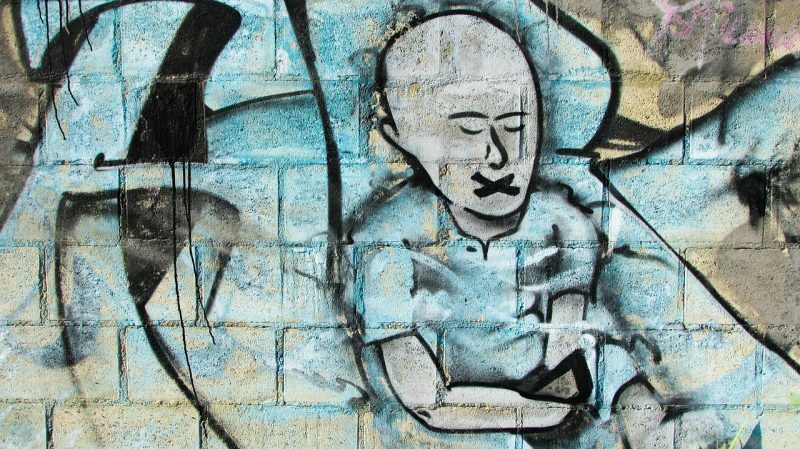 This wave of online censorship is happening in parallel with a deep political crisis in which Nicolás Maduro's government faces relentless opposition protests due to the serious economic, food and health crises in the country. 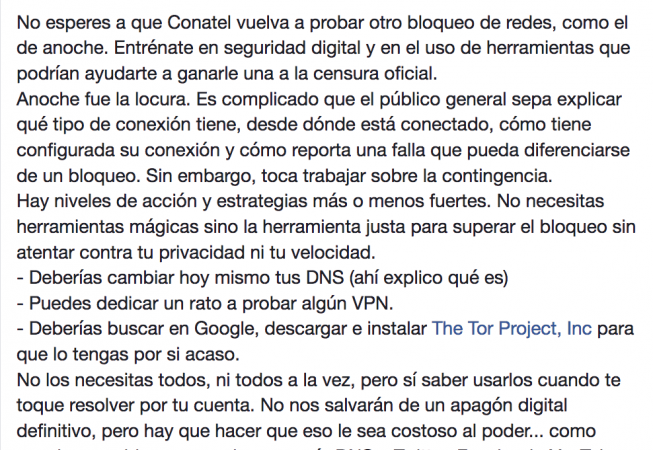 En el pasado se ha observado el patrón de que luego de que CANTV bloquee un sitio web, siguen los demás proveedores. Volvimos a observar este patrón con el proveedor Movistar que comenzó a bloquear Twitter. Pedimos a la comunidad que estén atentos a futuras noticias relacionadas para ayudar a ejercer presión en caso de un bloqueo más permanente. There seems to be pattern, as seen in previous blockages, in which once CANTV [the state telecom company, which dominates the national market] blocks a website, the rest of the internet providers follow. We've observed the same pattern with the internet provider Movistar, that started blocking Twitter. We ask the community to pay attention to related future posts to help exert pressure in the event of a more permanent block. The National Telecommunications Commission (also known as CONATEL, Comisión Nacional de Telecomunicaciones) is the body that all internet providers in the country must answer to. Una autoridad decidió hacerlo sin juicio ni decisión de un tribunal, sino por vía administrativa. Authorities decided to do it without a judge or jury's decision, but through administrative channels. Screenshot from Facebook public profile of Luis Carlos Diaz. 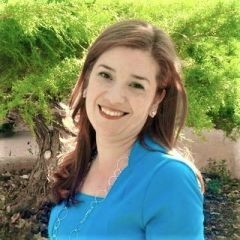 Don't wait for Conatel to block the network again like they did last night [to] train yourself in digital security and the use of tools that could help you to win the battle against official censorship. Last night was madness. It is complicated for the general public to understand what type of connection they have, where the connection comes from, connection configuration and how to differentiate a blockage from another connection issue. Nevertheless, it is time to work on a contingency plan. There are different action levels, and some decent strategies. You do not need magic tools, just the right tool to get around the block without risking your privacy or service speed. You will not need all of these all at once, but it is important to know how to use them when needed. These won't spare us from a total and definitive shutdown, but we should make it costly for the ones in power… Like last night when they blocked the access through DNS to Twitter, Facebook, YouTube and Instagram (access was available from mobile applications), and it was back one hour later. Never underestimate the impact of blocking on #internetVE just because you know how to change your DNS. It is a violation to EVERYONE's rights.